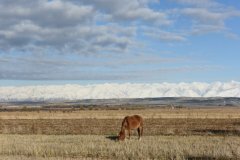 This is a unique experience to grant you the opportunity of discovering the popular places in Uzbekistan and the fascinating landscapes of Kyrgyzstan. You will explore the history, culture, traditions and the architecture of these countries throughout the Dayney. After your arrival at Tashkent Airport, you will meet the English-speaking agent. Transfer to the hotel, check-in, leisure time. We will start our trip by visiting the Old City of Tashkent: from the Chorsu Bazaar, through the Amir Timur Square, the Independence Square, to the Museum of Applied Arts and the “Soviet” Metro. In the morning, we will depart to Samarkand by TGV Afrasiyab (the high-speed railway). Upon arrival, our transfer will greet us from the station to the hotel. In the afternoon, we will arrange a city tour in Samarkand. The first stop will be at the Registan Square, the Bibi-Khanym Mosque - dating back to the 15th century, as well as the Central Bazaar, which is located right next to the Shah-i-Zinda Complex. The sightseeing also contains a visit to the Observatory of Ulugh Beg and the Mausoleum of Gur-e-Amir. In the morning, we will discover Afrasiab Museum, which is dedicated to the history of the ancient Samarkand City. The trip will continue to the five cupolas Mausoleum of Saint Daniel; it is constructed by Amir Timur at the beginning of the 14th century. Later, we will head to Konigil Village in order to see the manufacturing process of the silk paper. In the evening, we will return to Samarkand, have a leisure time and overnight at the hotel. In the morning, after the breakfast, we will transfer to Bukhara, where we will have a walking tour accompanied by the local guide. During the day, our schedule will be rich with several visits: the Poi Kalon Architectural Ensemble, the Mir-i Arab Madrasah of the 17th century, the Magok-i- Attari Mosque, the Madrasas of Ulugh Beg and Abdulaziz Khan. Afterwards, we will discover the ancient Ark Citadel, the Lyab-i Hauz Ensemble and the Chor Minor Madrasah of the 19th century. In the morning, we will continue strolling around Bukhara City. Whereas, we will visit the Sitorai Mokhi-Khosa Palace, which was the residence of the Bukhara's Emir in the summer during the 19th-20th centuries. Afterwards, we will proceed to visit the Chor-Bakr memorial complex, which is a necropolis of the 16th century, as well as the Pilgrimage Site of Baha-ud-Din Naqshband Bukhari. After the tasteful breakfast, we will depart to Khiva. On the way, we will stop at Amu Darya River in order to admire the splendid and picturesque surrounding landscape. After our tasty lunch, we will arrive at Khiva, check-in at the hotel. Free time. Overnight. In the morning, after the breakfast, our city tour will start with a stroll to Itchan Kala - the fortress of the 17th century (the interior Khiva City), which is inscribed on the list of UNESCO's World Heritage Site and consists of sixteen madrasas. Later, we will visit Kunya-Ark Citadel, the Mausoleums of Allauddin Khan and Mahmud Pakhlavan, the Minaret of Islam Khoja, the Mosques of Masjid-Al Haram and Djuma, the Allah Kuli Khan Madrasah, as well as the Tash-Khovli Palace. Free time in the evening for the individual discoveries. Overnight at the hotel. We will have a free day to discover Khiva by ourselves. Transfer to the airport, flight to Tashkent. Upon arrival, we will check-in at the hotel, leisure time. 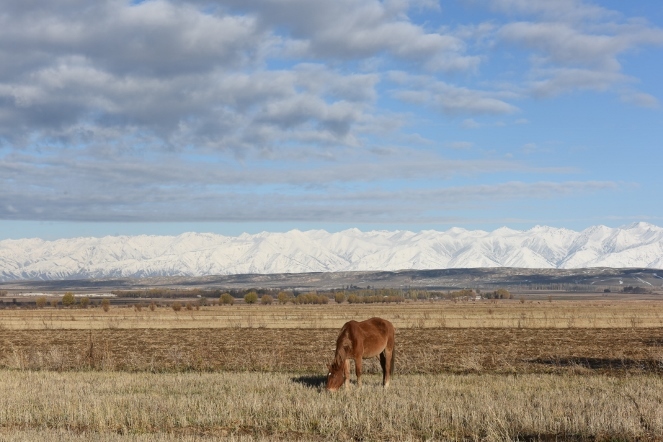 In the morning, we will depart to the Fergana Valley, one of the most beautiful places in Uzbekistan. The steep road connects the Fergana Valley with the rest of Uzbekistan by crossing through the picturesque Kamchik Mountain Pass (2267 m above sea level). The first stop will be in Dangara Village, where we will visit the house of the renowned woodcarver. In the afternoon, we will arrive in Kokand in order to discover the Khudayar Khan Palace, the Jami Mosque, the Madrasa of Kamol-Kazi, the Mausoleums of Damai Shakhon and Madari Khan. The tour will continue to the Rishton City, where we will meet a famous potter craftsman. In the evening, we will arrive at Fergana and stroll in the Ahmad al Farghani Park. After which, we will check-in at the hotel and have a leisure time. In the morning, we will cross the border of Uzbekistan-Kyrgyzstan by passing the customs, and arrive in Osh - Kyrgyzstan. It is the second largest city in the country and one of the most ancient in Central Asia. Upon arrival, we will have a city tour of Osh, which was founded by King Solomon 3000 years ago. Hence, we will visit the National Historical and Archaeological Museum, and the colorful Osh Bazaar - one of the biggest markets in Central Asia, which is situated on the Great Silk Road. In the afternoon, we will have a transfer to the airport to catch our flight to Bishkek. Upon arrival, we will depart to the hotel and check-in. This tour from Osh to Bishkek can be organized by car as well, the duration is around 10 hours. We will start our day with a visit to the Ala Archa National Park, which is a rich biodiversity reserve, attracts visitors by its beautiful mountainous landscape. The Ala Archa River flows along the alpine gorge, surrounded by snow-capped peaks and wooded slopes. Here, we will enjoy some free time strolling in the park. In the afternoon, we will return to Bishkek to have a city tour: by visiting the Oak Park, the Ala-Too Square, the Philharmonic Building, the Manas Statue and Victory Square. In the morning, our scenic tour will give us the opportunity to admire the beauty of the splendid Issyk-Kul Lake while passing beside it. On the way, we will explore Burana Tower - the minaret of the ancient Balasagun City from the 11th – 13th centuries. After, we will depart to the petroglyphs Museum of Cholpon-Ata, where we can admire more than 900 colorful rocks dating back to the 8th century BC. After the delicious lunch, our last visit for this day will be the History Museum of the Russian Orthodox Church in Cholpon-Ata. After a day full of excitement, we will arrive at the hotel, dinner and leisure time. After the breakfast, we will have a city tour in Karakol by visiting the Russian Orthodox Church and the Chinese Dungan Mosque, which was constructed without any nail in 1910. In the morning, we will have an extraordinary trip to the picturesque Jeti-Oguz Gorge, it is well-known for its coniferous forest, the flower glades and the red sandstone formations. All along the way to Kochkor Village, we will have a stop at the impressive “Skazka” Gorge (Fairy Tale). Also, we will have a chance to visit the atelier, where we can see the Kyrgyz carpets’ production process. After the breakfast, we will discover Song Kol Lake (3016 m). Here, we will be invited to the yurts to taste "koumys" - the traditional beverage. In the morning, we will head to the mountainous Village of Kyzyl-Oi, which is situated at an altitude of 1800 m. above sea level. Here, we will discover the majestic and extraordinary surrounding mountains of this village. It is an ideal place for an absolute relaxation. Afterwards, we will return to Bishkek. Preparations for departure. Overnight at the hotel.